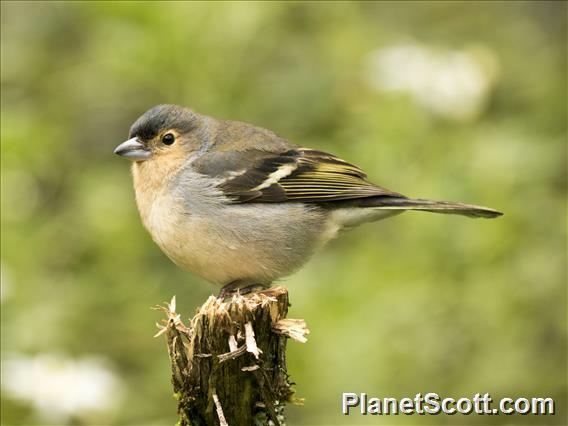 The chaffinch is one of the best-known and most common of all British birds (5). Both sexes can be easily identified in flight when they reveal double white flashes on the wings and white tail-sides (3). In summer the males have colourful plumage, with a rosy-red breast and cheeks and a bluish-grey crown and nape of the neck. These colours fade somewhat in winter. Adult females and juveniles have a buff or greyish coloured breast and greyish-green upperparts (2). Chaffinches produce a variety of calls, including a loud, clear pink call when perched (2). The musical rattling song is also loud (6).